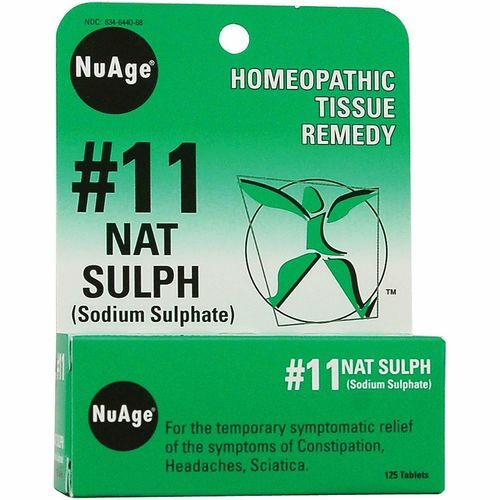 NuAge Homeopathic Remedies' No 11 Nat Sulph contains all natural natrum sulphuricum. Advertências: Do not use if imprinted cap band is broken or missing. If symptoms persists for more than seven days or worsen, contact a licensed healthcare provider. If you are pregnant or nursing, seek the advice of a licensed healthcare provider before using this product. Keep out of reach of children. Notas: Can be taken with other medications. Ingredients: Natrum Sulphuricum 6X HPUS in a base of Lactose, N.F. Recommended Use: Adults and children over six years of age take 4 tablets. Children ages one to six take 2 tablets. Dissolve under tongue three times a day. Use more frequently (every 15 minutes for up to 8 doses) with acute conditions. NuAge Homeopathic Remedies Avaliações de Clientes.